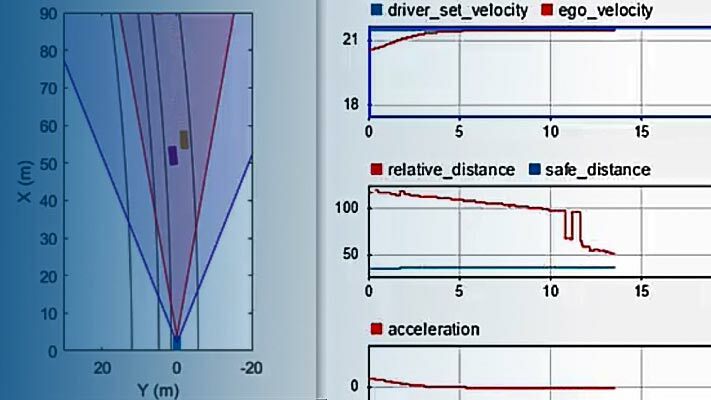 This example shows how to perform forward collision warning by fusing data from vision and radar sensors to track objects in front of the vehicle. Forward collision warning (FCW) is an important feature in driver assistance and automated driving systems, where the goal is to provide correct, timely, and reliable warnings to the driver before an impending collision with the vehicle in front. To achieve the goal, vehicles are equipped with forward-facing vision and radar sensors. Sensor fusion is required to increase the probability of accurate warnings and minimize the probability of false warnings. Vision sensor, which provided lists of observed objects with their classification and information about lane boundaries. The object lists were reported 10 times per second. Lane boundaries were reported 20 times per second. Radar sensor with medium and long range modes, which provided lists of unclassified observed objects. The object lists were reported 20 times per second. IMU, which reported the speed and turn rate of the ego vehicle 20 times per second. Video camera, which recorded a video clip of the scene in front of the car. Note: This video is not used by the tracker and only serves to display the tracking results on video for verification. Obtain the data from the sensors. Fuse the sensor data to get a list of tracks, i.e., estimated positions and velocities of the objects in front of the car. Issue warnings based on the tracks and FCW criteria. The FCW criteria are based on the Euro NCAP AEB test procedure and take into account the relative distance and relative speed to the object in front of the car. For more information about tracking multiple objects, see Multiple Object Tracking (Computer Vision Toolbox). The visualization in this example is done using monoCamera and birdsEyePlot. For brevity, the functions that create and update the display were moved to helper functions outside of this example. For more information on how to use these displays, see Annotate Video Using Detections in Vehicle Coordinates and Visualize Sensor Coverage, Detections, and Tracks. This example is a script, with the main body shown here and helper routines in the form of local functions in the sections that follow. For more details about local functions, see Add Functions to Scripts (MATLAB). The multiObjectTracker tracks the objects around the ego vehicle based on the object lists reported by the vision and radar sensors. By fusing information from both sensors, the probability of a false collision warning is reduced. FilterInitializationFcn: The likely motion and measurement models. In this case, the objects are expected to have a constant acceleration motion. Although you can configure a linear Kalman filter for this model, initConstantAccelerationFilter configures an extended Kalman filter. See the 'Define a Kalman filter' section. AssignmentThreshold: How far detections can fall from tracks. The default value for this parameter is 30. If there are detections that are not assigned to tracks, but should be, increase this value. If there are detections that get assigned to tracks that are too far, decrease this value. This example uses 35. NumCoastingUpdates: How many times a track is coasted before deletion. Coasting is a term used for updating the track without an assigned detection (predicting). The default value for this parameter is 5. In this case, the tracker is called 20 times a second and there are two sensors, so there is no need to modify the default. ConfirmationParameters: The parameters for confirming a track. A new track is initialized with every unassigned detection. Some of these detections might be false, so all the tracks are initialized as 'Tentative'. To confirm a track, it has to be detected at least M times in N tracker updates. The choice of M and N depends on the visibility of the objects. This example uses the default of 2 detections out of 3 updates. tracker - The multiObjectTracker that is configured for this case. The multiObjectTracker defined in the previous section uses the filter initialization function defined in this section to create a Kalman filter (linear, extended, or unscented). This filter is then used for tracking each object around the ego vehicle. % input is an objectDetection and the output is a tracking filter. % trackingEKF, or trackingUKF for constant acceleration. % rate model, or write your own models. % state vector are initialized to zero. % assigned a large measurement noise value to account for that. % Step 6: Create the correct filter. Filtering out unnecessary radar clutter detections. The radar reports many objects that correspond to fixed objects, which include: guard-rails, the road median, traffic signs, etc. If these detections are used in the tracking, they create false tracks of fixed objects at the edges of the road and therefore must be removed before calling the tracker. Radar objects are considered nonclutter if they are either stationary in front of the car or moving in its vicinity. Formatting the detections as input to the tracker, i.e., an array of objectDetection elements. See the processVideo and processRadar supporting functions at the end of this example. tracker - The multiObjectTracker that was configured earlier. See the 'Create the Multi-Object Tracker' section. time - The current scenario time. The output from the tracker is a struct array of tracks. The most important object (MIO) is defined as the track that is in the ego lane and is closest in front of the car, i.e., with the smallest positive x value. To lower the probability of false alarms, only confirmed tracks are considered. Safe (green): There is no car in the ego lane (no MIO), the MIO is moving away from the car, or the distance to the MIO remains constant. Caution (yellow): The MIO is moving closer to the car, but is still at a distance above the FCW distance. FCW distance is calculated using the Euro NCAP AEB Test Protocol. Note that this distance varies with the relative speed between the MIO and the car, and is greater when the closing speed is higher. Warn (red): The MIO is moving closer to the car, and its distance is less than the FCW distance, . is the forward collision warning distance. is the relative velocity between the two vehicles. is the maximum deceleration, defined to be 40% of the gravity acceleration. This example showed how to create a forward collision warning system for a vehicle equipped with vision, radar, and IMU sensors. It used objectDetection objects to pass the sensor reports to the multiObjectTracker object that fused them and tracked objects in front of the ego vehicle. Try using different parameters for the tracker to see how they affect the tracking quality. Try modifying the tracking filter to use trackingKF or trackingUKF, or to define a different motion model, e.g., constant velocity or constant turn. Finally, you can try to define your own motion model. % The |ReadDetectionsFile| function reads the recorded sensor data file. %   of the array corresponds to a different timestep. %   boundaryType, offset, headingAngle, and curvature. %   corresponds to a different timestep. %   Note: z is always constant and vz=0. % not used in further calculations. % Lane boundaries are updated based on the laneReports from the recordings. % the previous lane boundary is used. % The radar objects include many objects that belong to the clutter. %   sensorID=1: video objects, the measurement is [x;vx;y]. %   sensorID=2: radar objects, the measurement is [x;vx;y;vy].